I like January first up its my birthday, next Tuesday if you must know, secondly its a buying trip to Paris for three days (next Friday) where my head gets so full of ideas that at night in the hotel room I literally canât sleep. Thirdly itâs the start of new things, dreams and ideas that were simmering on the back burner now get shunted to the front burner. Plans that got made last yearÂ have changed (thought we were moving from our current store to a larger one down the block but the landlords are (putting it a far too politely) putting up too many hurdles. Amazingly for me I havenâtÂ lingered onÂ it, Iâve pulled the plug, detached myself from the situation and moved on, giving it nota Â seconds more thought.Â but then Iâve always been quite good like that. Once its over its over no reminiscing or wishing things were different, or playing moody tunes on the iPod or taking long strolls in the hills âthinkingâ. Nope onwards, upwards as they say. Iâve got big plans for this house, over hauling the school room, finishing off the bedroom, doing something with the darn stair well and knocking out the back wall of the bathroom and creating a roof terrace to block the neighbours ugly who knows what in the back yard. Anyhow digressing digressing we are here to talk about interiors not my daily yabberings or problems. 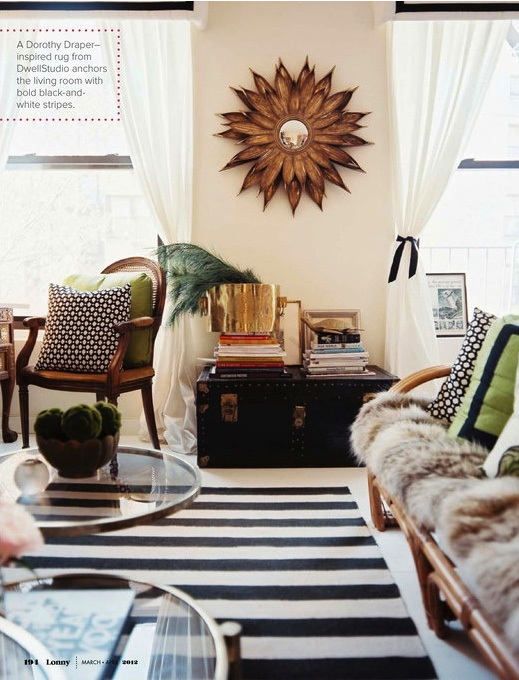 One thing Iâm seeing a lot in American interiors is the love of the black and white rug, and although I have none here I like them very much. Supremely graphic they give a room an edge and make anything on them look way more expensive than it really is. 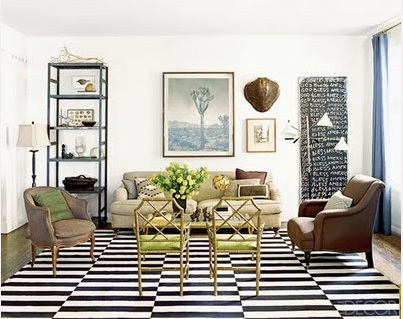 You can pay big bucks or you can make a quick trip to Ikea and buy their black and white stripped one as I did last year for the TV show I was working on and it literally transformed the room. Also if I recall correctly Design Sponge somewhere in their archives shows you how to take a super cheap white rug and paint on the stripes the whole thing costing no more than around Â£40 â clever no? Also it doesnât matter if your interiors are pale or dark it works equally well with both, a few images to inspire below.